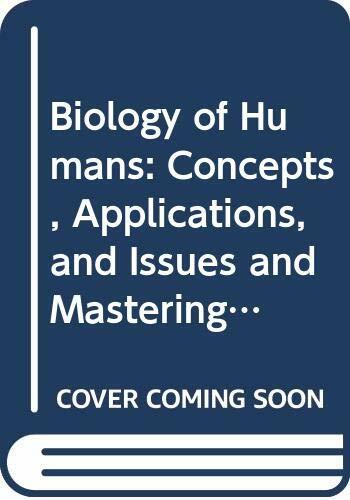 Known for its unique “Special Topic” chapters and emphasis on everyday health concerns, the Fifth Edition of Biology of Humans: Concepts, Applications, and Issues continues to personalize the study of human biology with a conversational writing style, stunning art, abundant applications, and tools to help you develop critical-thinking skills. The authors give you a practical and friendly introduction for understanding how their bodies work and for preparing them to navigate today’s world of rapidly expanding–and shifting–health information. Each chapter now opens with new “Did You Know?” questions that pique your interest with intriguing and little-known facts about the topic that follows, and the expanded online resources within MasteringBiology® are now referenced at the end of each chapter. The Fifth Edition also features a new “Special Topic” chapter (1a) titled “Becoming a Patient: A Major Decision,” which discusses how to select a doctor and/or a hospital, how to research health conditions, and more. Judith received her B.S. in biology from Wagner College (Staten Island, NY) and her doctorate in biology from New York University. She has more than 35 years of teaching experience at the University of Massachusetts, Amherst, until recently specializing in introductory level courses. In 2009, she was selected as a College of Natural Sciences Fellow for Blended Learning and developed a hybrid course in introductory physiology. The insights into student concerns and problems—gained from more than 30 years of teaching Human Biology and 20 years of team-teaching the Biology of Social Issues—have helped shape this book. In 1986, Judith was honored with a Distinguished Teaching Award from UMass. In addition to teaching, she has written articles in peer-reviewed journals, contributed chapters to several introductory biology texts, and written numerous laboratory manuals. With the author team of McGuire and Jakob, she wrote Perspectives on Animal Behavior, Third Edition. Betty received her B.S. in biology from Pennsylvania State University, where she also played varsity basketball. She went on to receive an M.S. and Ph.D. in zoology from the University of Massachusetts, Amherst, and then spent 2 happy years as a postdoctoral researcher at the University of Illinois, Champaign-Urbana. Her field and laboratory research emphasize the social behavior and reproduction of small mammals. She has published more than 50 research papers, coauthored the text Perspectives on Animal Behavior as well as several introductory biology study guides and instructor manuals, and served as an associate editor for Mammalian Species, a publication of the American Society of Mammalogists. Betty taught Human Biology, Introductory Biology, Vertebrate Biology, and Animal Behavior at Smith College. She now teaches Mammalogy and Vertebrates: Structure, Function, and Evolution at Cornell University.